In 1997, Sylvester Stallone was in need of a major career boost. Just two years prior, he starred in the laughably bad Judge Dredd and then went on to do the bland exercise known as Daylight (with a moderately pedestrian role). His solution this time around: Put on some extra weight (in the realm of Raging Bull), star alongside the cast of Goodfellas (Ray Liotta, Robert De Niro, Frank Vincent), and parlay a sort of low key, under the radar performance that could give him a sentimental Oscar nomination. Well Sly failed to get nominated for anything that year. Hey, don't get wrong, I love the guy (ROCKY! ROCKY!). But there's no way in the world he deserved award consideration for underplaying his performance in Cop Land (the movie that I am about to review). To revert what I just said, Sly's stint in this movie is in fact, extremely underplayed. It got to the point where I figured I could turn on the mute button while watching it on TV and still not miss a beat. This hammy concoction focuses on the character of Freddy Heflin (Stallone). He's a shy, deaf in one ear sheriff who patrols a small town (Garrison, New Jersey) right across the river from New York City. The town of Garrison, where Heflin lives and is in charge, includes lots of police officers (he doesn't qualify to be one of them because of his ear) that live there but do not function as working law enforcement (the policemen in this movie are not exactly model citizens due to the fact that in the first ten minutes, two of them drive drunk). So as the movie progresses, we find Heflin caught in a web of deceit when an internal affairs investigator comes by (Robert De Niro as Mo Tilden). He explains that the cops Heflin is harboring in his town are connected to the mob and are in the process of covering up a fake suicide by hiding one of their own. This character is played by Michael Rappaport as Murray "Superboy" Babitch. Babitch committed an accidental murder earlier by shooting two thugs on the George Washington bridge. His fellow officers led by Lt. Ray Donlan (Harvey Keitel) try to help him cover it up but in the end, the plan gets screwed up and all hell breaks loose. The director of Cop Land is James Mangold and he fared much better later on with Walk The Line (2005). This was one of his first films and it looks as if he's in way over his head with this cast of acting giants. Because of this, they suffer as well. 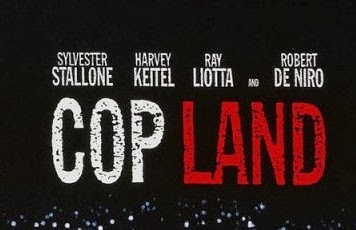 Cop Land isn't really about the story of the movie; it's about showcasing the actors' screen time. And it seems everyone in the cast is trying to out duel each other (expect for Jeanne Garofalo and Noah Emmerich playing side characters who look like they're reading off of cue cards). Let's be reasonable, the fault of Cop Land doesn't entirely fall on Stallone as mentioned earlier (he's the only actor that doesn't go over the top, get it). 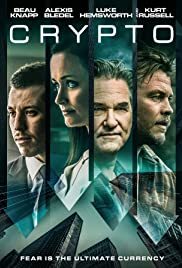 The film in general feels sterile and projects itself as something that came off a hypothetical movie assembly line with instructions on how to view it. The storytelling has a few layers here and there but in the end its real simple stuff that you as the viewer, could spot from miles away. Oh and the background music gets real suspenseful when one of the actors nails a line. Yeah, it's safe to say that this flick really is a piece of work. It constantly reminds us as an audience that hey, this cast is darn good, and hey check out these powerful performances. Oh there's a lot of grandstanding in Cop Land and added to that, there were constant moments where everyone had to deliver long strained dialogue that made them look bad (with all the scenery chewing by the cast, I figured there was nothing left to chew on but cardboard). For instance, Keitel and De Niro get some extra screen time to test their acting wings in separate sections of the movie. It's painfully obvious that they are repeating themselves. Better yet, they seem to be explaining too much as they spout lines that sort of sound like run on sentences. As an audience we get it. We don't need our plot points spoon fed to us. GEESH! In the end, I'd say there were very high expectations of this movie when it came out. I remember like it was yesterday. It's by no means a bad film but I think it just tries too hard and somewhat insults the viewer along the way. Mangold said in an interview that he wanted to make Cop Land as sort of a modern day Western. I could see that especially toward the final act when Stallone goes on a gun toting rampage High Noon style. If you like Westerns it might meet your standards as a moviegoer (I emphasize the word might). But for me, after seeing this thing, I almost forgot that I had to review it. It's movie amnesia at its finest. That's another way of saying that it's totally forgettable. So with that in mind, I'll leave you with De Niro's character looking like Luigi, the pizza chef uttering the trailer's best line, "you had your shot, and you blew it! you blew it!" It's funny. I feel the exact same way about this motion picture.